Jason O Mahony » Blog Archive » The welcome rise of UKIP. The welcome rise of UKIP. This week’s breakthrough for UKIP should be welcomed by anybody who supports a healthy, vibrant democracy. The fact that a country as eurosceptic as Britain does not have a major national “out” party in parliament is an outrage, and if anything underlines the failings of the British political system. One of the spin-offs for political reformers in Britain (even pro-Europeans) must be that the potential rise of a viable fourth party will show just how ridiculously unsuitable First Past The Post is as an electoral system in a modern multi-choice age. It’s not too fantastic to suggest that a strong performance by UKIP in a general election could result in the Tories winning the most votes but not the most seats. Could it make the Tories wake up (as their Australian counterparts did) to the fact that FPTP may not be the great voting system they think it is? The other point which should be made is a warning about assumptions by the Tories that UKIP is somehow their errant gene pool, who can be coaxed back into the Tory fold. This may no longer be the case, because UKIP voters would seem to be exercised by issues wider than just the EU, including immigration and cuts to public services. Working class UKIP voters, for example, seem to believe that they are being undercut by workers from central Europe. Given that the Tories are not opposed to free movement within the EU, the only solution to that is tougher enforcement of employment regulations, something which the Tories would presumably be against. As well as that, talk of deals with the Tories is becoming much less attractive to UKIP as it develops a respectable tally in opinion polls as the “F**k you all” two fingered option to the political establishment. Finally, UKIP’s rise should be welcomed because it has underlined the media obsessed paralysis of the three main UKIP parties. 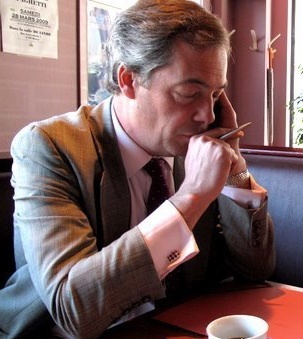 Every time Nigel Farage says something mildly off the political track, he gets accused of being a bigot or a racist, and guess what: it doesn’t hurt him politically at all, because he speaks in the language that non-political man down the pub speaks, and when you call him a bigot you’re calling Pub Man a bigot too, and he knows he’s not. Farage is by far the most entertaining player on the political stage since Boris, primarily because he doesn’t cage everything in get out clauses and political speak. In short, he sounds authentic, and politics could do with a bit more of that.